The number of each type of vertebrae, referred to as the vertebral formula, has greatly diversified during tetrapod evolution. However, the association between the sacral vertebrae and the hindlimbs has never been uncoupled throughout the course of this evolutionary diversification. We recently elucidated the developmental mechanism by which GDF11 is secreted from the posterior axial mesoderm to align the position of the hindlimb with the sacral vertebrae. Our evo-devo study also revealed that the evolutionary diversity of hindlimb positioning resulted from heterochronic shifts in Gdf11 expression, which led to coordinated shifts in the sacral-hindlimb unit along the anteroposterior body axis. Throughout evolutionary history, species diversity has increased worldwide. As such, we are interested in the mechanisms that generate morphological diversity among the vertebrate species. When visiting a zoological park, it is quite easy to see that each tetrapod species has a unique limb position. For instance, frog hindlimbs are positioned at the 9th vertebra, mouse at the 27th, and in the python snake they are located around the 275th, although these are hardest to see. In our most recent paper by Matsubara et al., we focused on how positional diversity of the hindlimb has increased during tetrapod evolution while tightly maintaining the topographical relationship between the sacral vertebrae and the hindlimb. We first performed embryonic experiments using chicken embryos as a model. We found that a secreted factor, GDF11 (growth differentiation factor 11), integrates the positioning of the sacral vertebrae and hindlimbs by inducing Hox gene expression in each of the primordia, the axial mesoderm and the lateral plate mesoderm. Furthermore, we demonstrated that the onset of GDF11 function in both the axial mesoderm and lateral plate mesoderm determines the position of the sacral-hindlimb unit along the anteroposterior body axis in the chicken embryo. We then wanted to know whether this “mechanistic relationship” also functioned in other tetrapods that possess unique hindlimb positions. Thus, we decided to compare the onset of Gdf11 expression in 8 tetrapod species that possess uniquely positioned hindlimb buds (the primordia of the hindlimb) during development. Over the course of this research we were faced with many challenges. For the comparative experiments, we sought to use species belonging to taxa different from mouse or chicken. When we started collecting embryos, we had to develop methods for obtaining embryos from non-model organisms for which experimental systems had yet to be established. For example, there was almost no information available about the period when we could obtain snake embryos during the course of one year, which turned out to be quite restricted. Under such limiting conditions, we had to obtain a series of embryonic stages with the widest age range possible for each species in order to identify the interspecies differences. Therefore, we were faced with the task of developing efficient and precise harvesting methods de novo for early-stage embryos before we could perform the evo-devo experiments. 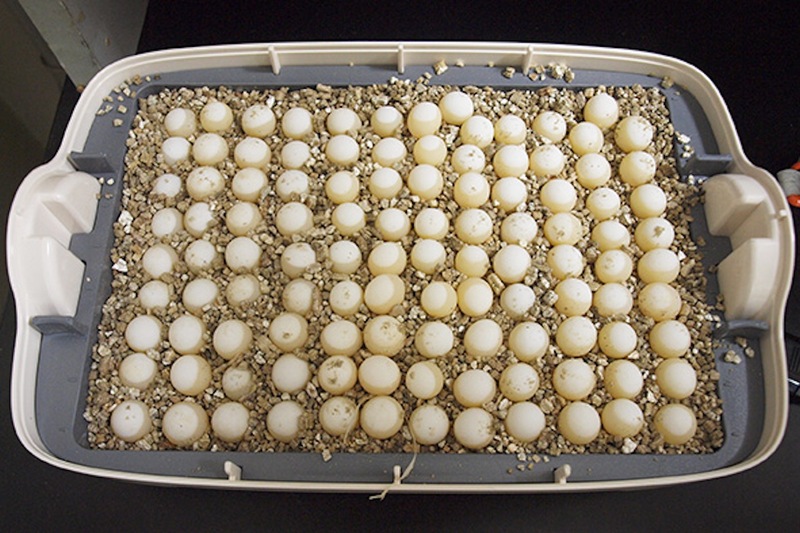 We ultimately were able to develop efficient harvesting methods for eggs from both the Chinese soft-shelled turtle (see photo 1) and the Japanese striped snake. Additionally, we established a method for developmental staging of Japanese striped snake embryos as well as an ex vivo culture method (see photo 2). This was a particularly favored report as we showed high-quality color images of snake embryos before oviposition. We published these methods-based articles (Matsubara et al., 2014, 2016) prior to the publication of our recent paper. Although it took over 4 years to establish efficient and precise harvesting methods for the early embryonic stages of the Japanese striped snake, we could now easily obtain appropriately staged embryos as needed. After overcoming these initial hurdles, we commenced a series of comparative experiments using embryos from 8 different species. Through our evo-devo-based approaches, we determined that the greater the number of somites (the vertebral primordia) a species has between the first somite and the hindlimb bud, e.g. Emu (see photo 3) and the Japanese striped snake, the later Gdf11 expression is initiated. To date, an appropriate method for comparing developmental time between species had yet to be developed. However, we showed that there was a significant correlation between the onset of Gdf11 expression and the hindlimb position represented by the somite level at the center of the hindlimb primordium. These results imply that somite stage, i.e. the number of formed somites in the embryo, may be useful for comparing developmental time between species. In addition, our results suggest that a heterochronic shift in the onset of Gdf11 expression in relation to somite stage resulted in a heterotopic shift in the hindlimb bud along the anteroposterior axis during tetrapod evolution. Brian K. Hall described in his textbook (Evolutionary developmental biology, 2nd edition) that a major role for heterochrony may be to facilitate heterotopy. Our results provide a clear and simple example in support of this opinion. Thus, through our method development and experimental approaches, we revealed that positional diversity in tetrapod hindlimbs can be explained by a simple difference in the onset of just one gene, Gdf11. Matsubara, Y., Sakai, A., Kuroiwa, A. & Suzuki, T. Efficient embryonic culture method for the Japanese striped snake, Elaphe quadrivirgata, and its early developmental stages. Dev. Growth. Differ. 56, 573–582 (2014). Matsubara, Y., Kuroiwa, A. & Suzuki, T. Efficient harvesting methods for early-stage snake and turtle embryos. Dev. Growth. Differ. 58, 241-249 (2016).